Selling Hart Seed is Risk Free! Our sliding scale discount is based on the volume that you sell, NOT on your “sell through percentage”. This means that you can keep your seed rack looking clean and filled the entire season, without sacrificing your margin. You’re guaranteed a profit, no matter what the weather. We package over 300 varieties of flower, vegetable and herb seeds. Each colorful, eye-catching packet has a full description and planting instructions on the back and our pricing is still down to earth. Your customers know the Heart, and look for the quality seed that it represents. The famous “Plant Hart’s Seeds” logo lets your customer know you carry the highest quality seed available at down-to-earth prices. 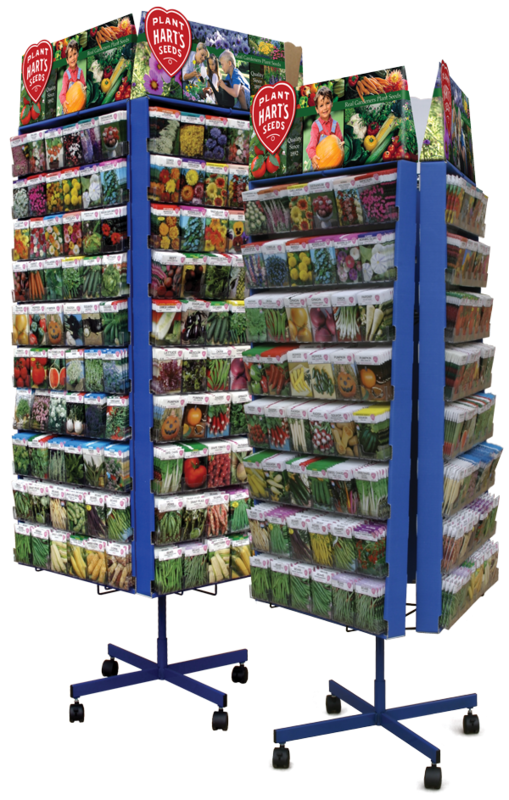 Our eye-catching display headers invite our customers to believe in the possibilities…Real Gardeners DO Plant Seeds, and can have success using quality Hart’s Seed. Take a look at our selection of displays to figure out what would be best for you and your store!